Do you like clowns? No, you don't. Nobody likes clowns (except my friend Virginia, for some strange reason that probably has to do with her being raised by thespians). 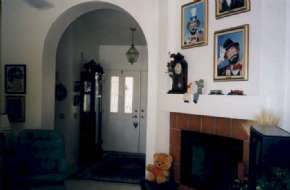 So a simple rule of thumb is this: When trying to make a house appealing to potential buyers, do not have the only interior photo be of clowns. While I find clowns creepy too, those are famous, expensive clowns. Red Skelton painted them and even the prints fetch a pretty hefty price tag. I don't care. It's still wrong. Thanks a lot for posting that link. Now I'm going to have even more nightmares than I was going to already. Omigod, is that my mom's house? She also has a collection of Red Skelton paintings. They were very popular in the 1970s. Don't ask me why.